LUXEMBOURG/BRUSSELS (Reuters) - European Union Brexit negotiator Michel Barnier said on Monday British Prime Minister Theresa May should endorse a permanent customs union with the bloc - as proposed by the opposition Labour party - to break the impasse over their looming divorce. Barnier told a news conference in Luxembourg that time was "extremely short" to conclude a deal before Britain is due to leave the bloc on March 29. He then met UK Brexit Secretary Stephen Barclay for what both sides said were "constructive" talks in Brussels late on Monday. "It's clear from our side that we are not going to reopen the withdrawal agreement but we will continue our discussion in the coming days," Barnier said afterward. The EU is urging May to work with Labour leader Jeremy Corbyn to unlock ratification of the withdrawal agreement she negotiated with Brussels. British lawmakers overwhelmingly rejected the deal, agreed in November, in a vote last month, leaving Britain on course for an abrupt Brexit with no transition period to minimize expected economic disruption. "I found Corbyn's letter interesting in tone and in content," Barnier said earlier in the day in Luxembourg of the Labour leader's Brexit proposals, sent to May. "Something has to give on the British side." In a reply to Corbyn published by May's office late on Sunday, she rejected the idea of a customs union, saying Britain must be able to strike its own trade deals after Brexit. Barnier said he understood May did not want to delay Brexit to win more negotiating time and reiterated the controversial Irish border fix - or "backstop" - in Britain's withdrawal agreement was an insurance policy the EU hoped never to use. "This time that remains is extremely short," Barnier told the joint news conference with Luxembourg Prime Minister Xavier Bettel. "The withdrawal agreement which we agreed with Theresa May's government ... remains the best way to ensure an orderly withdrawal of the UK." Barnier said it was up to London to provide clarity on what is next - a view shared by Bettel. "We never pushed for Brexit, we never demanded Brexit," Bettel said. "The responsibility started in London and is still in London." 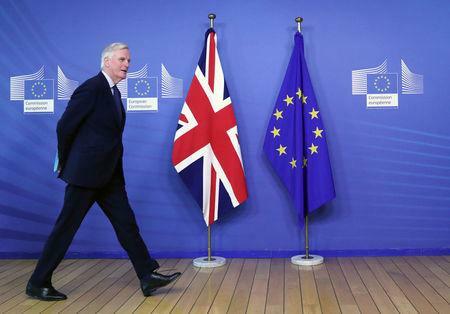 Barnier reiterated the bloc's offer was to tweak the political declaration on EU-UK ties after Brexit that forms part of the package to reflect a plan for a closer future relationship that could obviate the need for the contentious backstop. "We are determined to organize an orderly withdrawal. This orderly withdrawal is the prerequisite that we need to build a ... future relationship," he said.